Renova is a highly unique and reusable, one-page creative portfolio theme with fully responsive layout built using Bootstrap framework version 2.3.2. 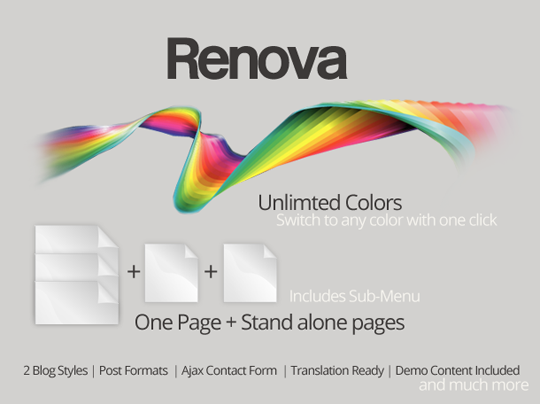 Renova is a one page theme with flat design trend but a advanced blend of uniqueness.This theme features Single Page Scroll-Down layout with full screen BG slideshow. 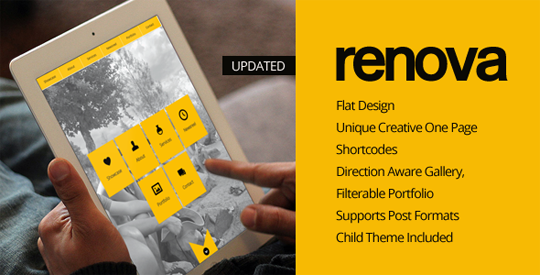 Renova comes with a completely editable layout with the power of Bootstrap framework and wordpress. This can make it extremely easy for ordinary users to setup their own website. But it is also possible to extend the template to any level as your creative freedom.